Experience the romance of sailing on this 1.5-hour sunset sail around the Inner Harbor. As the sun sinks into the water, enjoy gorgeous views of the skyline. 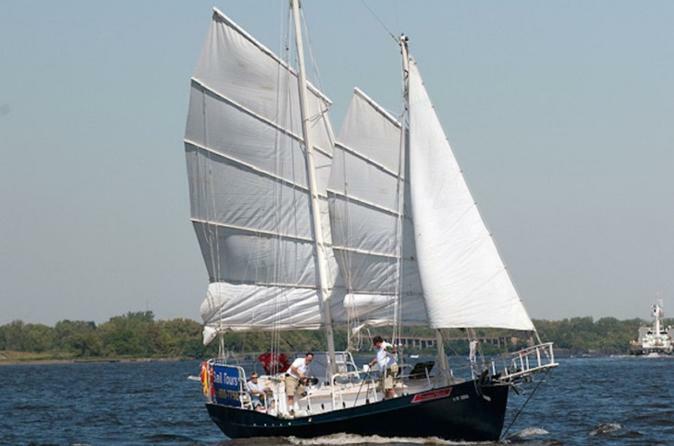 Bring wine for a special experience on this Inner Harbor sunset sail. Thanks for making plans to go sailing with us on the schooner Summer Wind! We've moved to a new dock this season, so I wanted to make it easier for you to find us. We sail from the Ritz-Carlton Dock now. Sadly, the Ritz-Carlton Dock has no address and no sign, so how will you know where we are? The closest parking lot is at the Rusty Scupper Restaurant and Inner Harbor Marina at 400 Key Highway. There's also some street parking along Key Highway, if you can find any. If you're at Rusty Scupper and facing the water, turn right. You'll see Water Taxi Stop #4. Walk past that and along the Promenade for about 5 minutes and you'll come to the next set of docks in front of the condo's. That's the Ritz-Carlton Dock. The Summer Wind will be on the end (you'll see our masts) and a crew member will be at the gate. Another crew will be walking the Promenade between the boat and Rusty Scupper. Just look for someone in a gray "American Sailing Tours" T-shirt. As you sail through the water in the Inner Harbor, listen to the romantic voices of Frank Sinatra, Nat King Cole, Tony Bennett, and other crooners. Feel the warm summer breeze as you watch the sun sink into the harbor. Admire the gorgeous skyline as the lights begin to shine. Enjoy the stars in the sky as you relax and enjoy the company of your loved one. Sail the night away on this romantic sunset sailing experience. Please arrive 15 minutes prior to departure time for boarding. A crewmember will meet you at the gate. The boat does leave on time.